I Intensify the light of morning until you Awaken. 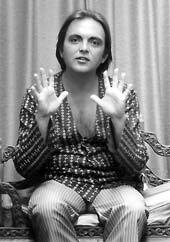 During the course of His first year of Teaching-Work, Avatar Adi Da Gave an extraordinary series of Discourses. In those Discourses, He communicated an exquisite summary of His "radical" Teaching-Revelation. And He passionately Offered to everyone the Gift of the heart-relationship to Him (or Satsang with Him), as the True Means of Divine Liberation. That series of Discourses — which took place between April 25, 1972 and late 1973 — is the heart of My "Bright" Word, a new book from the Dawn Horse Press. The basic principle of egoic existence, the search, which He later enunciated in its simplest terms: "You want to feel good — because you feel bad. Therefore, you are seeking — in order to feel good." Truth cannot be Realized by seeking for it. The seeking itself is the problem. When there is no seeking, Truth (or Reality) is Obvious. Freedom (or Divine Liberation) is not dependent on any objective entity or process. Freedom (or Divine Liberation) Is Always Already the Case. The logic (or process) of separation itself, of enclosure and immunity, informs every function of the living being, every experience, every act, every event. Observe your own self-contracting activity. Understand your own self-contracting activity. Transcend your own self-contracting activity. My "Bright" Word is a Gift Avatar Adi Da has Given to all beings for all time. Through this book, He has made it possible for everyone to experience the first words He Spoke as the Divine Heart-Master, the Very Incarnation of Truth Itself (or Reality Itself). These — and all His Words — are His Offering to you of the Perfect Spiritual Process. That Process is the heart-relationship to Him. And that Process culminates in His Divine Gift of Perfect (and Permanent, and inherently egoless) Love-Bliss-Happiness — the Most Perfect Realization of the "Bright". The excerpt from My "Bright" Word is a Talk entitled Guru As Prophet, in which Avatar Adi Da explains why — as the Avataric Incarnation of the Divine — He does not have a conventional, "public" role in the world.